More than 1000 MPW eQSL's from the CQ MM DX contest. Using the lowest possible power in a contest QSO is not so difficult as it seems. 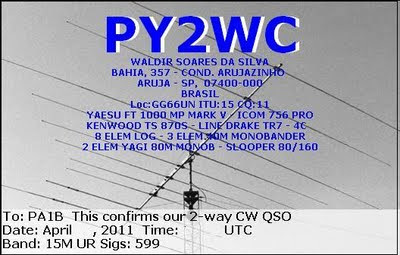 In the CQ MM DX contest I was suprised by the excellent propagation, which made it possible to work with stations in South America and North America with just 1 W or 2.5 W.
After 8 QSO's with 1 W and 2.5 W, I heard PY2WC calling CQ, so I tried 2.5 W.
I fell off my chair when Waldir answered: SAQ, which means that he was using QRP and this was a 2 way QRP QSO. It was only after a few QSO's, also with 2.5 W, I realised that I could have made the QSO with a lower power. More than an hour later I heard Waldir again and made a second QSO, but now with 1 W (980 mW). Thank you Waldir for a new DXCC in QRPp, thus less than 1000 mW. Tip: Just make a second contest QSO, with a lower power if you can. This list shows only the 1000 MPW QSO that are confirmed via eQSL. I actually made many more 1000 MPW QSO's in the CQ MM DX. After I receive an eQSL, I determine the distance using the QTH Locator and the Miles per Watt. I place the 1000 MPW info in the comment field of the return eQSL. Most QSO's were made on 21 MHz. Although I made many DX QSO's 34% of the QSO's were made with QRPp. And 70% with more than 1000 MPW. In total I made 56 QSO's in the CQ MM DX contest. I worked SA, NA EU and SA. I had great fun. My RIG is a FT-817 and the antenne is an Inverted Vee. I always use QRP, but never a fixed power of 5 watts. Thanks to all the excellent operators that made this contest QSO's possible. When I started as a HAM in 1990 I used a homebrew QRPp transceiver for 7 MHz, which I call the HM7 and an inverted Vee antenna. In the 10 years that I used this CW transceiver extensively, I worked many European countries with a power of only 500 milliwatts in many normal QSO's and many contest QSO's. The excellent design comes from the book solid state design for the radio amateur. I used this transceiver as a homestation and on holiday. Homebrew, QRP and CW (morse code) is a fabulous combination.CW is the most intriging mode of all. I noticed that you probably can not come closer to the signal, than in CW. During the years that I used this TRX, I had great fun and I noticed that the activity on the band is more important than the antenna. With 500 mW the signals of the other stations must be S9 or more. Especially contest stations are eager to work everyone, so many QSO's can be made in a contest. Further I discovered that propagation is more much important than the antenna. The Inverted Vee is not the best antenna, but the daily changes in the propagation can not be beaten by any antenna. In many CW contest QSO's and other QSO's, I use the lowest possible power. When a received signal is S9, I answer with 500 mW. And when the signal is S9 + 10 dB, I use 50 mW. I get 50 mW with the FT-817 on 500 mW and an attenuator of 10 dB. When I change band, while the propagation is very good, I first look for very strong stations. If the station still calls CQ, without answering other stations, after I have sent my call (*), then I know that my signal is not heard. Don't loose your cool in (6), because the frequency has to be absolutely clear, for this weak, but readable, signal to be heard. Doubling the power is the optimal step to increase the power. This is a step of 3 dB. A step of 1 dB is too small and 10 dB is too large. Using the lowest possible power is actually QRO-ing with low power. Today my wife and I visited the city of Gorinchem, also known as Gorkum. We did some shopping in the old centre. I took a some pictures of the city mill "Never Pefect" (Nooit Volmaakt) Later we visited "Outside the water gate" (Buiten de waterpooort) to have a nice look over the river Merwede. We had a wonderfull day. Vandaag bezochten mijn vrouw en ik de binnenstad van Gorinchem, ook wel bekend als Gorkum. We deden wat inkopen in het oude centrum. Ik nam een paar foto's van de stadsmolen Nooit Volmaakt. Later bezochten we "Buiten de Waterpoort" om een mooi uitzicht over de rivier de Merwede te hebben. We hadden een geweldige dag.